Celebrate the entrepreneurial spirit of Syracuse University student filmmakers at a “Film Tasting” event to sample some of this season’s best student films and animations, from shorts to featurettes. 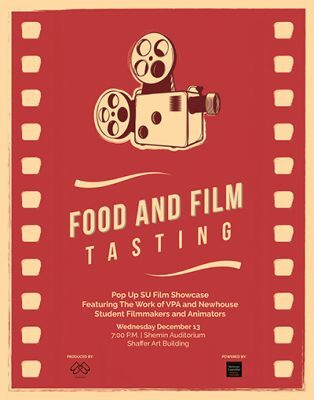 The popup student film and animation showcase will take place at 7 p.m. on Wednesday, Dec. 13, in Shemin Auditorium, Shaffer Art Building, and will feature works by transmedia students in the College of Visual and Performing Arts, with help from students in the Newhouse School and other program areas. The “Film Tasting” is being produced by Broad Brothers, a Blackstone LaunchPad student venture. 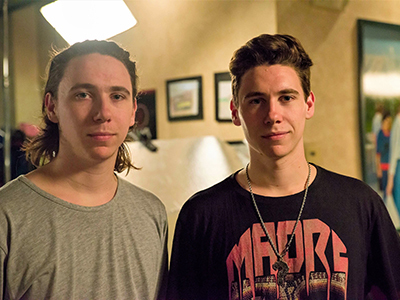 Broad Brothers Productions was founded by twin brothers Aja and Kaelan Selbach-Broad, who are juniors in the VPA film program. Broad Brothers launched at Syracuse University as a student venture and also produced the recent Blackstone LaunchPad promo film. Broad Brothers was recently profiled in Study Break for its filmmaking, including client corporate videos, concerts and festivals, music videos and shorts. They have shot such artists as The Chainsmokers and Marshmello. Their work has been featured in a number of film events, and they intend to fully launch their production company upon graduation.